The Uk NHS is truly and totally free at the point of use and rank as the best in the world. It is safe to say that The US president, Donald Trump is prepared to perpetuate falsehood either deliberately or ignorantly in order to push a particular narrative. The binary politics in America today where the Trump supporters take his statement as the Gospel truth and those against Trump automatically disregard his comments as lies are pushing debate based on truth or logic to the abyss. President Trump’s comment about the state of the United Kingdom National Health Trust is one of those deliberate or ignorant falsehoods. 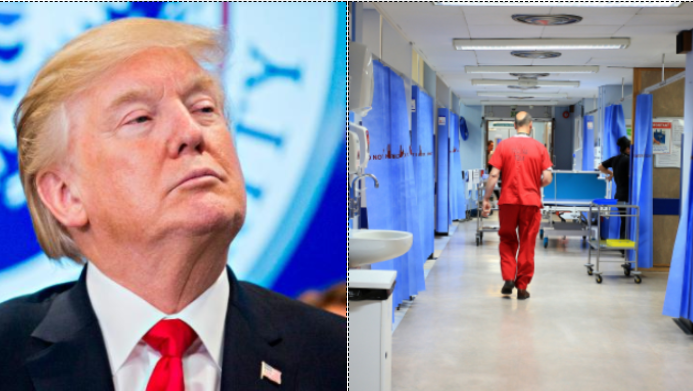 Although this was aimed at countering the Democrats position on Healthcare funding, however, Trump’s readiness to depict the NHS as a broke and failing system is not necessarily a new low, but an unsurprising pattern. This follows the retweeting of series of extremist video from a far-right group in Britain and the regular spat with the Mayor of London. NHS indeed has its challenges, mainly arising from being a political ball, an ideological context between the two main parties, despite these, it still ranks as the best healthcare system in the world by a team of American Researchers. The study by The Commonwealth Fund compared 11 developed countries including the USA, Switzerland, Sweden, France, Germany, United Kingdom, Canada, Norway, Netherland, New Zealand and Australia, even though the United Kingdom ranks as one of the lowest in spending as a percentage of GDP. Before you take a swipe at our incredible NHS, maybe you should look a little closer to home. Although the Health Secretary and Jeremy Corbyn have responded to refute and correct Trump’s interpretation of the protest over the weekend, what the President intends to achieve with his tweet has already been achieved. He targeted the tweet at a domestic audience to achieve a domestic political goal, even though he smeared his closest ally in the process. It has always been about the president, it does not matter whose horn is gore, he will play dirty so long as he emerges triumphant in the estimation of his caucus. The idea that anyone would prefer the American Healthcare system where your treatment outcome and survival is tied to your social class, bank balance and job to a true and totally free at the point of use NHS in the UK is laughable, the audacity to even use the NHS “crisis” as a point to justify the more expensive and less effective American health system is senseless and illogical but not surprising, but this is President Trump, no rules applies.